The navy is often one of the first to come to the rescue after an earthquake. In 1931 the HMS Veronica was in port when the twin cities of Napier and Hastings were devastated by a magnitude 7.8 earthquake that struck Hawke’s Bay, and when the 7.8 magnitude earthquake hit Kaikoura in November last year it was the navy again who played a vital part in the recovery effort. Lieutenant commander Matt Kaio was in charge of the first navy vessel on the scene after the November earthquake. The 85m HMNZS Wellington was deployed to carry out seabed surveys off Kaikoura straight after the earthquake so the much-larger vessel, HMNZS Canterbury, could get supplies in and start evacuating people three days later. It was fitting Kaio hosted the naval cocktail function on board the Wellington at this year’s Art Deco festivities in Hawke’s Bay, when Napier and Hastings celebrate the unique Art Deco period the town has become known for. The charity cocktail function raised $20,000 to set up two education grants to go to Kaikoura High School. The grants of $2000 are for one male and and one female student, and will last for five years. 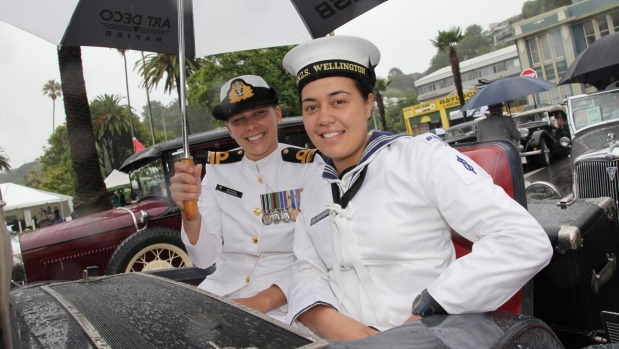 Kaio said the Royal New Zealand Navy was in its 75th year and it was an appropriate gesture to give the money to Kaikoura because the Wellington was the first ship to assist after the earthquake. It was also the navy that assisted with the rescue, evacuation and law and order to the people of Hawke’s Bay. “This is a Hawke’s Bay way of helping Kaikoura and other regions who suffered the same devastation,” he said. Kaikoura High School principal John Tait said it was a generous and thoughtful offer from the navy and people of Napier who supported the cocktail event. “It’s a significant gesture because it’s so practical. “So many of our students don’t have access to our education out of town. “The financial support really means a lot,” said Tait. Kaio said the navy remained incredibly close to Hawke’s Bay because of the earthquake. Every year the ties are deepened as Art Deco Weekend starts. Among the fun and laughter a more sombre occasion marks that fateful day when crowds gather at the Colonnade memorial, for the Veronica Bell Parade. The ship’s bell is briefly restored to its place with a full military ceremony, and is just one event the navy take part in. Tait said the cocktail party was the unofficial start to the weekend on Thursday night and the popular event sold out within 48 hours. “It’s kind of a good feeling all round the defence force can come together and help. “It’s great to be able to help put Kaikoura.